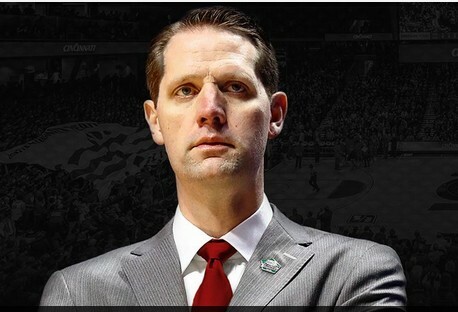 John Brannen has been named the 27th head coach in University of Cincinnati men's basketball history, Director of Athletics Mike Bohn announced Sunday, April 14. A formal introduction will take place Monday. Brannen has served as Northern Kentucky University's head coach since the 2015-2016 season, taking the Norse to unprecedented success as the school's athletics department underwent reclassification. Since earning active Division I status eligibility prior to the start of the 2016-17 season, the Norse men's basketball program has compiled a 72-30 overall record, making three consecutive postseason appearances (NCAA Tournament [2017, 2019], NIT ), winning back-to-back Horizon League regular-season championships (2018, 2019) and claiming a pair of conference tournament titles (2017, 2019). No other school in the nation has enjoyed NKU's amount of success in its first three years with active status at the Division I level. "We are thrilled to welcome John, his wife Lisa and their daughters, Jaylee and Katelyn, to the Bearcats family," Bohn said. "He has a proven record as a head coach, longtime ties to the local community and coaches an exciting style of basketball. We were impressed with his passion, drive, determination and basketball acumen during the interview process where he truly emerged as the best coach to lead the Cincinnati basketball program with a bright future." Brannen, whose coaching career spans 20 seasons, owns an 82-52 career record as head coach. He registered an 81-51 ledger in four seasons at NKU and a 1-1 mark as Alabama's interim head coach at the end of the 2014-15 campaign. The 2017 Horizon League Coach of the Year, Brannen led the Norse to a 24-11 record in 2016-17, the Horizon League Tournament title and an appearance in the NCAA Tournament in the school's first season of active status eligibility. NKU's win total was an improvement of 15 victories from the previous season, marking the third-best turnaround in the nation behind only UCLA and Minnesota. Brannen guided NKU to a 22-10 mark, the Horizon League regular-season championship and an NIT appearance in 2017-18. Last season, NKU posted a Division I-era record 26 wins with eight losses, claiming the league regular-season championship and tournament title and its second NCAA Tournament appearance in three years. "It's truly an honor to take over such a storied program at the University of Cincinnati," Brannen said. "The Cincinnati-northern Kentucky community is special to my family and we are happy to remain at home. I want to thank President Pinto, Mike Bohn and the search committee for this opportunity. We are thrilled to join a world-class University and continue to build on the historic success of Bearcats basketball and the incredible lineage of former coaches." Brannen's players have earned 10 Horizon League postseason accolades, highlighted by Drew McDonald receiving league player of the year honors this past season. NKU finished 2018-19 ranked 11th in the nation in both total assists (592) and assists per game (16.9). The Norse also ranked nationally in field goal shooting percentage (27th at .478), scoring margin (28th at +9.6), assist-to-turnover ratio (32nd at 1.34), three-point shooting defense (34th at .314), rebound margin (43rd at +4.5) and scoring offense (44th at 78.5 points). Brannen came to NKU after spending six seasons (2010-2015) at Alabama coaching under Anthony Grant, four as an assistant coach and two as the associate head coach. The Crimson Tide made four postseason appearances during his stay. Alabama finished as the runners up at the 2011 NIT, posting a 25-12 overall mark and winning the Southeastern Conference West Division title. The Crimson Tide made an NCAA Tournament appearance the following season and later advanced to the NIT quarterfinals in 2013 and the second round of the NIT in 2015. Brannen served as interim head coach for Alabama's two games in the 2015 NIT. While in Tuscaloosa, Brannen helped sign Alabama's 2011 recruiting class that ranked fifth in the nation according to Rivals.com. Prior to Alabama, Brannen served as an assistant coach at VCU for three seasons (2007-09) under Anthony Grant, helping lead the Rams to three 20-win campaigns, two NCAA Tournament appearances (2007, 2009) and a showing in the NIT (2008). The 2007 squad posted a 28-7 mark, upsetting Duke in the first round of the NCAA Tournament. Brannen helped recruit Larry Sanders, who later was drafted by Milwaukee as the 15th pick in the 2010 NBA draft and also helped recruit four of VCU's five starters on its 2011 Final Four team. Brannen also was an assistant coach at St. Bonaventure (2004-06) for three seasons, Eastern Kentucky (2001-2003) for three seasons and Charleston for the 2000 campaign. A native of nearby Alexandria, Ky., Brannen attended Newport Central Catholic High School. He began his collegiate playing career at Morehead State before transferring to Marshall for his final two seasons, playing for head coaches Billy Donovan (1996) and Greg White (1997). He was named the Southern Conference Player of the Year as a senior in 1997, averaging 20.9 points. He scored 1,008 points in two seasons with the Thundering Herd. A Rhodes Scholar finalist, Brannen received scholarships from both the NCAA and Southern Conference. He earned a degree in business management from Marshall in 1997 and played two seasons of professional basketball in Belgium's First Division before beginning his coaching career.